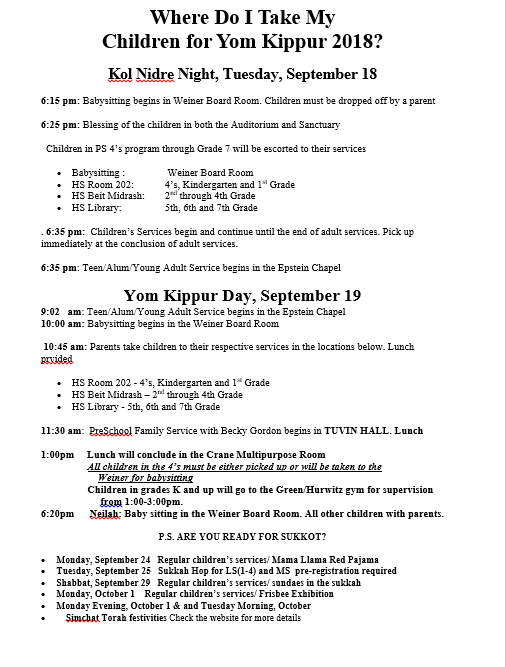 Beth Tfiloh Congregation & Community School | Come home to Beth Tfiloh for the High Holy Days. Whether you're new to the community or a longtime Beth Tfiloh family, you'll feel right at home at BT for Rosh Hashanah and Yom Kippur . . . and all through the year! BT’s dynamic faculty and alumni-led services and programs make the High Holy Days a fun, creative and meaningful experience for children and teens. A light lunch is provided. For information about Beth Tfiloh membership packages, please contact Holly Venick, Director of Synagogue Life, at 410-413-2244, or Eve Kresin Steinberg, Executive Director at 410-413-2251. The microphones and sound amplication systems in our Dahan Sanctuary, Epstein Chapel, Auditorium, and Tuvin Assembly Hall have all been fully approved for use on Shabbat and Yom Tov by the Zomet Institute, an Israeli non-profit organization specializing in designing technology and electronic appliances that comply with Jewish law.